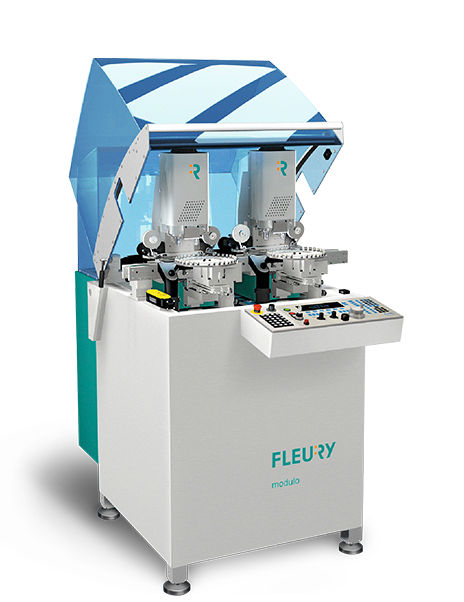 Fleury SA is a swiss company that was founded in 1964. We are developping innovative concept of modular transfer machine. We are also producing components for well-known watchmaking brands using our machines park. 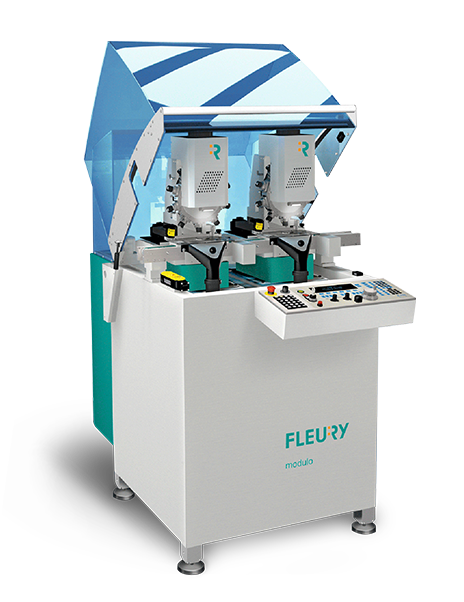 modulo is a modular transfer machine system that includes different types of machining and assembly modules. Our history is based on dry machining for watchmaking. Thanks to a lubrication system, there is also the possibility of machining hard materials such as steel and titanium. 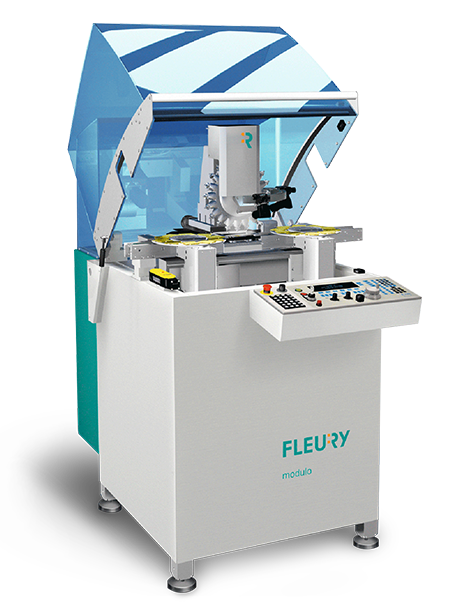 Complete machining of blanks Fleury SA manufactures complete components on its modulo machines at its factory in Balerna, Ticino. With modulo we create the ideal transfer line for specific parts and guarantee an optimal cost for each batch size. For prototypes or series, the delays are shortened by machining both sides in one pass. As soon as the machine is set up, we produce finished parts. Sandblasting and washing are done internally. The fully automated manufacturing solution with modular linear transfer machines. Your partner for the manufacturing of small components. 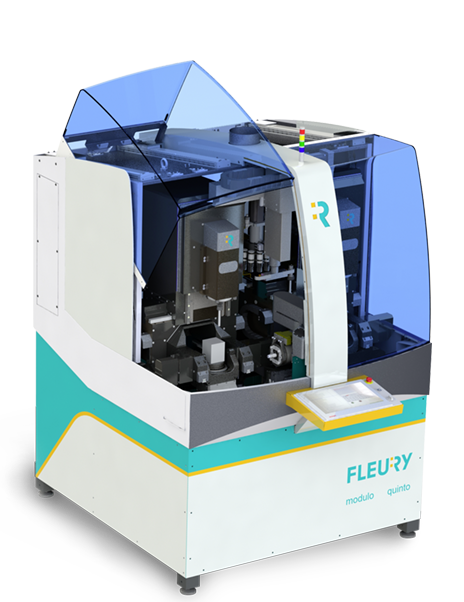 Fleury SA has over 50 years’ experience in machine construction for the production of main plates and bridges in the watchmaking industry. There are currently over 500 modulo units in use. modulo enables you to manufacture main plates and bridges in a single operation without stamping, 24 hours a day, 7 days a week. The production capacity of your production line is always adjustable to your production batch sizes. Designed for batch sizes of 100 to 500,000 components, modulo guarantees a minimal reaction time with minimal production costs. 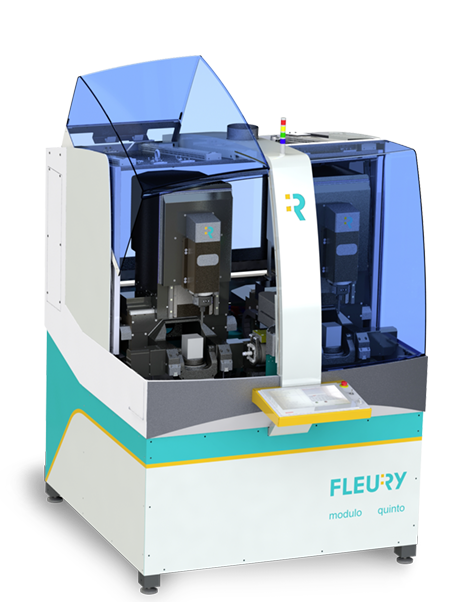 The new modulo ATC 70 machining center represents the most flexible module of the modulo product lines. Equipped with a compact chain tool holder with 70 positions, the modulo ATC 70 boasts a level of flexibility never before reached with the modulo system. Ideal for complex parts and small batches, the modulo ATC 70 permanently keeps all the tools you need for your production lines. The modulo RE is equipped with 10 spindles per unit and guarantees fast, precise and reliable tool changing. The modulo AL with its CNC boring head allows to mill holes, pivots and other shapes with just a single tool and only one clamping. You will achieve unrivalled precision. The modulo HO for horizontal machining is equipped with lathe tool holders and with tool spindles. The rapidly rotating fourth axis (C-axis) allows turning operations and milling, drilling and thread-cutting work in indexed mode. Thanks to a special mechanism, you can separate the finished part from the blank fully automatically. 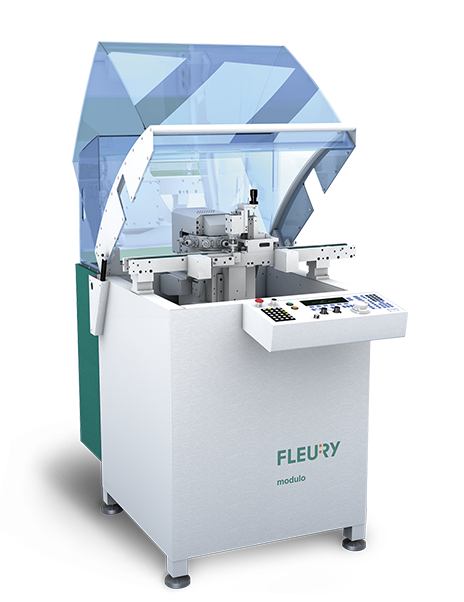 The modulo SP jewel and pin-setting module presses in rubies, pins, eccentric pin, brass tube and other components. A great many assembly steps in your watchmaking operation can be fully automated. Preassembly of mechanisms, wheels, bridges, springs, etc. 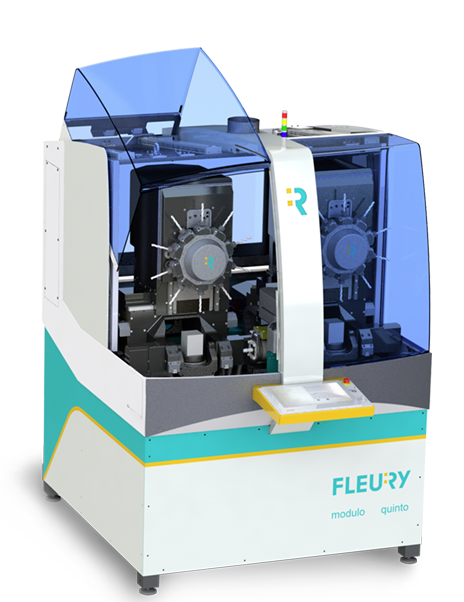 The modulo PE circular graining module is equipped with a system for the automatic tool length setting and reshaping of corundum rubber tools. Sufficient tools can be stored in the tool magazine to facilitate a high level of autonomy. Further equipped with a measuring system for a better process reliability. The modular5-axis linear transfer machine for fully automated production. Our new modulo5 is a 5-axis linear transfer machine able to combine machining processes such as milling, turning, boring and grinding in a single operation and to completely machine the workpiece on 6 sides. Each manufacturing unit is equipped with two 5-axis processing units and has its own control system, as well as automated pallet handling. Since modulo5 is fully automated, production can continue around the clock, 7 days a week. Due to its high power density (13kW per spindle) and for its small foot print, modulo5 offers an extremely competitive solution for the production of workpieces from small batches to mass production. The modulo5 ATC allows automatic tool change. The modulo5 allows extremely precise machining with a CNC boring head. The modulo5 RE allows precise machining with 10 spindles per machining unit. 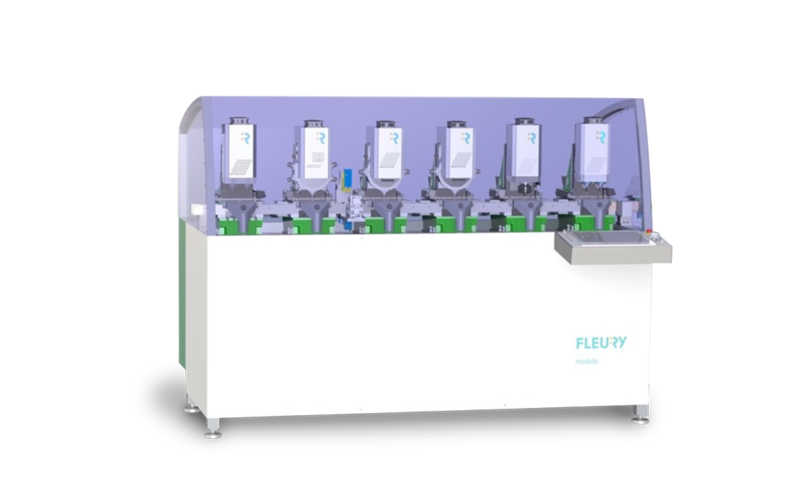 The new high productivity modulo is the solution for high volume production needs. Our modulo HP linear transfer machines are an ultra-competitive solution. With our multi-process machining solution composed of 6, 8, 10, or 12 stations and our optimized infra-structure, we can offer an unbeatable price-to-machining station ratio under CHF 100,000. 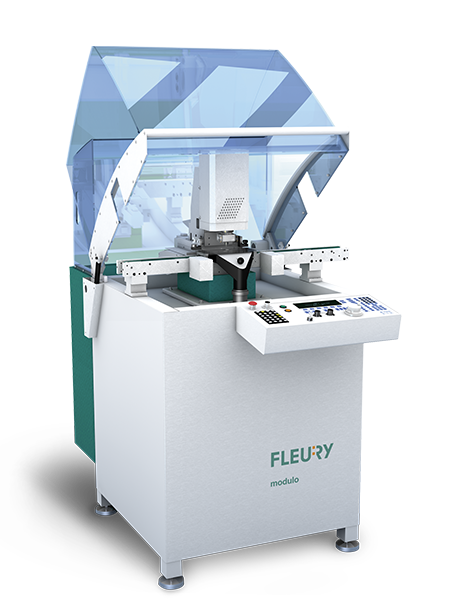 Perfectly suited for high volume production, the modulo HP can be composed of different machining stations for maximum flexibility. Our RE-4 station with 4 spindles on turret head, offers the best value in terms of productivity, flexibility, and quick return on investment. Production target : 1.8 millions of pieces per year. 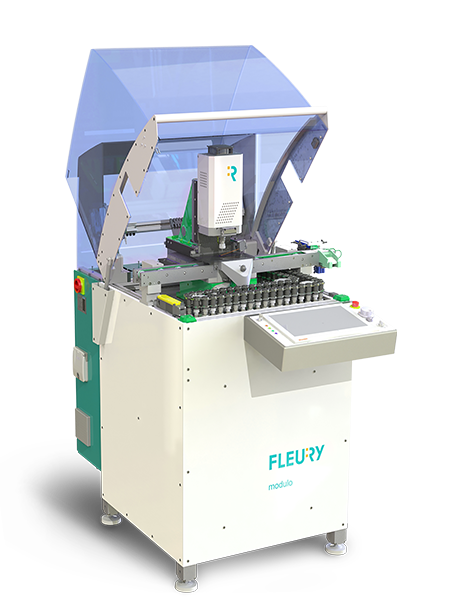 With two modulo5 machines and a robot for placing on palette, Fleury can guarantee to produce 1’833’499 pieces in one year. Discover how Fleury is able to succeed this challenge ! In case of a problem, our experts of maintenance are ready to help you as fast as possible. Doing that either per phone, videochat or on-site intervention, in order to find a solution to the problem. The preventive maintenance becomes always more important, this is why we have put in place the possibility to monitor the machines on line.